Aluminum Hydroxide Gel is used to treat symptoms of increased stomach acid, such as heartburn, upset stomach, sour stomach, or acid indigestion. Aluminum hydroxide is also used to reduce phosphate levels in people with certain kidney conditions (when managed by a physician). Since it contains no magnesium, it doesn't cause diarrhea that can be a side effect of some other products. 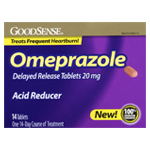 Omeprazole provides heartburn treatment for frequent heartburn that occurs 2 or more days a week. 24 hours of heartburn relief. Relief for nausea due to stomach upset. No salicylates. Safe for children with flu. Prevents heartburn due to acid indigestion brought on by eating and drinking certain foods and beverages. GAS FREE contains simethicone – the #1 doctor recommended ingredient for the fast relief of gas and its symptoms, including pressure, abdominal bloating and discomfort. Fully enjoy creamy ice cream, yogurt, milk and cheese again with Dairy Aid Caplets. These quality lactase enzyme supplements prevent gas, bloating, diarrhea and other internal issues associated with digesting lactose. Simply take before a meal to help aid digestion. Acid Gone Liquid quickly neutralizes stomach acid and helps keep acid down for hours. 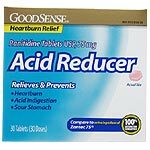 Acid Gone Extra Strength provides fast-acting, long-lasting heartburn relief by quickly neutralizing stomach acid and forming a foam barrier that helps block stomach acid from splashing up. Coats to provide fast relief. 5 symptom digestive relief: Upset stomach, heartburn, indigestion, nausea, & diarrhea. Relief of heartburn, acid indigestion, sour stomach and upset stomach. Relief of heartburn, acid indigestion, sour stomach and upset stomach AND gas. Relief of acid indigestion, heartburn, sour stomach and symptoms of upset stomach. Good Source of Calcium as Calcium Carbonate! Great Source of Calcium as Calcium Carbonate! Relieves symptoms of excess gas in the digestive tract caused by excessive swallowing of air or by eating certain foods. Treats frequent heartburn for 24 hours. Prevents the production of acid that causes heartburn. A single pill works for up to 24 hours. The only over-the-counter heartburn medicine that contains the active ingredient lansoprazole 15mg. Not intended for immediate relief; may take 1 to 4 days for full effect.